Picture yourself in the hinterland of British Columbia. You are many hundreds of miles from Vancouver. There’s a mining camp at one end of the road and a mining camp at the other. Most everyone here get an hourly wage. And the wage is generous. (These rough necks are paid like princes. Who would come to this god forsaken place otherwise?) And because there is nothing much to do here, the roughnecks work extra hours, most days and even Sundays. Add "time and a half" and "double time," and it’s not long before these people are worth a bundle. Periodically, they head for town. For most the destination is Vancouver, many hundreds of miles away. Guys, they are mostly guys, will hitchhike for a while. And they take buses when they must, and eventually they say, "F*ck it, I’m buying a car." And they do. They buy a Buick with all the trimmings. And away they go. The trouble is, the guys have been drinking since they left camp and by this time they are often blind drunk, and so, well, it’s not uncommon to come off the road and wrap the Buick around a tree. And here’s the weird part. The guys don’t get the Buick fixed. They just keep going. What they have done to the Buick captures what they do for the remainder of this trip to Vancouver and for the duration of their stay there. Make a hash of things. The "skid row" in Vancouver is there to greet them. The card sharks, hookers, and bars are seasoned tourist professionals, skilled at various kinds of value transfer. It will take a couple of weeks. But eventually our guys will wake up in a gutter without a dime. And here’s the other weird part. They will brush themselves off, and go back to the hinterland. Some will do this many times over several decades. 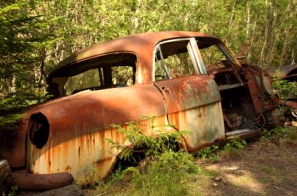 Which is way there are so many rusting cars on the roads of the interior of BC. From an conventional point of view this is deeply irrational behavior. Why endure the privations of life in the bush, and the exertion and the danger of this kind of labor, unless you are going to keep some part of what you earn? Surely, the point of coming here is to earn your way out. Not to spend your way back in. But the hinterland is a prison to which inmates keep returning by choice. In a sensible world, people would come here just long enough to make enough to buy the motel, dry cleaning store, or bowling alley that will release them from wage labor forever. But no, they take their stake and they squander it. These guys seem bent on destroying wealth. Which brings us to Pirates. I know you were waiting for the Pirate passage. I’m reading a nice little book called And a Bottle of Rum by Wayne Curtis. Here’s a passage. This destruction of wealth is a wonderful thing. Wealth for miners, pirates, and perhaps aboriginals is charged with potentiality. To keep this wealth is to do its bidding. Once you’ve made a small fortune in a logging camp, some convention says, you must leave the hinterland, pay that motel, and "start a new life." Which these loggers and miners devoutly do not wish to do. Hence those trips to town. These loggers are fighting demon wealth. Our loggers, miners, pirates (and aboriginals?) are defending their way of life. They are destroying the money that threatens it. They can see the potentiality of all this wealth, they can feel the cultural instructions embedded in it, and they are damned if they will give in it. Better, easier, truer to their life missions, to piss this money away. Actually, there is nothing irrational about this behavior. It has a job to do and it does well. But there is no economic model that came help us retrieve the rationality of this behavior, I don’t believe. To do this we need to look beyond "rationality" narrowly defined, beyond "interest" and "benefit" as it is usually construed. We need to capture the culture that supplies the meanings that shapes the lives that demands the destruction of wealth the results in all those rusted Buicks. There’s a method to the madness. In fact, it isn’t madness. Indeed, under carefully scrutiny a lot of economic behavior, even the b to b variation thereof, is not fully rational. But when the economists find things that do not find the paradigm, they insist these are "irrational." Um, but surely there is a grey area in between. That economic actors are not rational doesn’t mean that are irrational. The trouble is that the idea of rationality is so narrowly defined is to leave much of the human experience out of account. It is true that actors are sometimes not rational but they are almost never not interested. They are always driven by an idea, a concept, a preference, an "interest," and almost always this idea, concept, preference or interest comes from culture. So when Adam Smith excises culture from the proposition in a sense he assumes what he means to prove. And he leaves us with a model that can’t explain new Buicks any more than it can rusted ones. I mean if transportation is the object of the exercise, there’s an awful lot chrome that doesn’t seem germane. And no, we may not put the model on life support by evoking status competition and conspicuous consumption. Nice try, Mr. Veblen but there are so many more cultural meanings besides status at issue in any give Buick that you did not so much rescue the model as cleared the way for a more thorough going assessment of its insufficiency. I guess this post is my way of saying there is a lot of learn from loggers, miners and pirates. It’s just so very difficult to get them to come in for guest lectures. This entry was posted in Uncategorized and tagged anthropology, economics, network solutions, wealth, wealth destruction on May 7, 2010 by Grant. I enjoyed this article Grant — in fact, I’ve been lurking in the background for a while and am so appreciative of the ideas that you are disseminating into the world (and my brain!). I wanted to pipe up a bit about the concept of the “potlatch.” Although no PhD, I studied anthropology at Yale and have read / discussed the concept of the potlatch on more than a few occasions. The potlatch began with gatherings in which the hosting group would attempt to outdo each other – present more gifts, cook more food, etc. Demonstrating that you had more wealth (and perhaps even enough wealth to warrant waste) was equivalent to more prestige. Not unlike the TV “My Super Sweet 16.” As time went on, with all competitions of this nature, the stakes became greater and greater – eventually leading to the point that groups would sacrifice their general standard of living to throw these egregious ceremonies. Things really got bad when the white man entered and started trading for things like the notorious Hudson Bay blankets. The problem with this is that suddenly the tribes had a quantifiable manner to count and “win” the potlatches. Prior to this point, there was no directly quantifiable method to determine the value of a potlatch as everything in it was unique and handmade, gathered or caught. So, although one group might have had less to offer in terms of hand carved statues, maybe they were more beautiful (so subjective!) or, perhaps they had a larger salmon than the other group. Thus, although it escalated prior to the introduction of standardized goods, it exploded after it. When groups could count the number of blankets that they were willing to destroy (after all, the blankets were a currency, not a commodity like a fish or hand made totem), it brought the destruction to a whole new level, where, indeed, they were attempting to destroy the “wealth” they had accumulated from the white man. Thus, in the end, I’m not sure it would be a great corollary, as they purpose was to shame others, rather than destroy wealth for the sake of it. The current boom of crazy weddings, birthdays, bat mitzvahs, etc. are current parallels. But, indeed, I can see why, especially with the addition of quantifiable, standardized goods, that it could come across as such. And, concerning the overarching reason that miners / loggers / pirates burn through their wealth and return to their previous state is about comfort – as in cultural comfort. Most all of these people are either a) born into such a situation (as were their fathers and grandfathers) or b) running away from the mainstream life of owning a bowling alley due to discomfort in such a situation. Thus, even when away bingeing, they are not in their cultural comfort zone and will almost inevitably return to it, full of stories and tales that are the lifeblood of their cultural home. These stories are a key component to the culture and, without owning some themselves, they can never truly belong, thus the need for them to exit in the first place. Anyways, wow, I wrote more than I anticipated! It’s nice to find your blog, once again! (Lost you during the name-change debacle.) As always, much substantive cultural nourishment. Economists’ “rational/irrational” labeling of behavior is yet another example of the black and white thinking that has led to many of society’s current predicaments. Human-caused climate change is either true or false; governments should aggressively intervene or be starved; you’re with us or against us, etc. As Jason Ohler admonishes (in Then What? ), “you need to stop thinking of life as a set of either-or equations and start seeing it as a both-and multi-dimensional continuum. Either/or thinking makes you clever…both/and thinking makes you wise.” Indeed. Thanks, as always, for your brilliant observations, Grant! Great post (I enjoyed it the first time as well). I was reading a recent Sports Illustrated article on the Pittsburgh Steelers QB Ben Roethlisberger – who has managed to get himself in hot water with the NFL due to alleged misbehavior off the field – and I got thinking about this blog post. It seems like some professional athletes might fall into the same category as pirates and other destroyers of wealth.